Today for #SundaySupper our mission is to make something that is 5 ingredients or less. I came up with a few ideas, but one struck me that I just had to make. 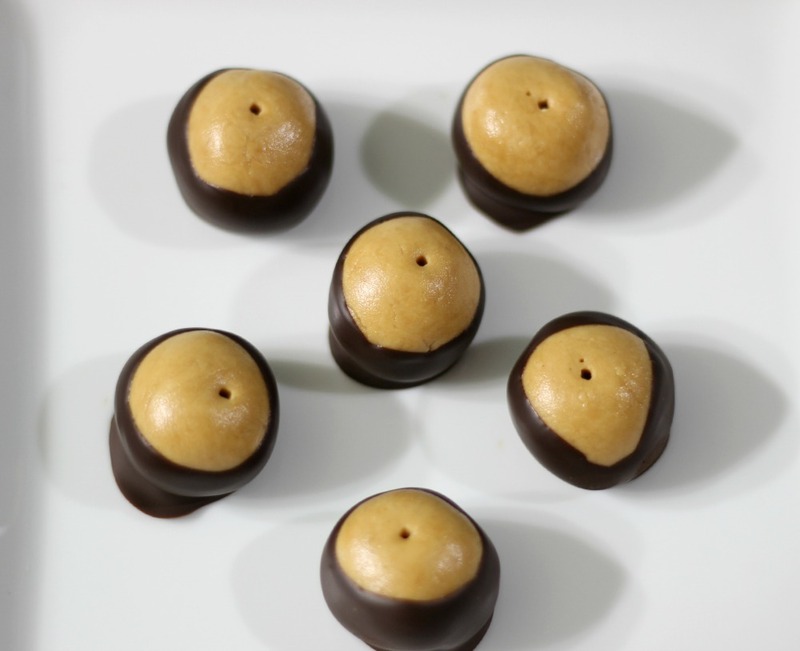 The inspiration for my recipe, happened last week at work when someone asked me, have you every heard of buckeyes? Ummmm, hello, peanut butter and chocolate, of course I have heard of buckeyes! Some people ask me the silliest question. So to prove to them that I knew what a buckeye was, I just had to make them and guess what? They are 5 ingredients! Perfect for my #SundaySupper challenge. Ohhhhhh Buckeyes, how I love thee, let me count the ways! Have you every had a buckeye? It’s kind of like a Reese’s Peanut Butter Cup, but WAY better! It’s got a sweet, creamy peanut butter middle, surrounded by dark chocolate with a little bit of peanut butter showing to make an eye. It is so delicious. I just love how it just melts in your mouth. Yum! I’m actually pretty proud how my buckeyes turned out, they actually looked pretty professional. Normally when I work with chocolate, I melt it in the microwave, but this time I made a double boiler, by placing a glass bowl over the top of a pot that had boiling water in it. It melted the chocolate perfectly, it was so creamy smooth. On this recipe I used Trader Joe’s Dark Chocolate Pounder Bars. I have to admit I just love Trader Joe’s Dark Chocolate. For the price, the quality is perfect. Their chocolate melts like a dream. The peanut butter filling is made with all natural creamy salted peanut butter, powdered sugar and vanilla extract. I beat it all together until it pulled away from the bowl. I took a teaspoon size amount and rolled it into a ball. It was kind of like play dough to me. Once I rolled them into balls, I popped a toothpick into the center of each one and then froze them for about 30 minutes. I added the toothpick to them made them easy to swirl into the melted chocolate. Once the were dipped in chocolate I let them harden in the refrigerator. Since I was making them without adding shortening to the melted chocolate I found that storing them in the refrigerator is best. That way the chocolate doesn’t melt. The reason I didn’t add shortening is that I never have cooked with it, so I don’t keep it in the house. If a recipe calls for it, I use butter instead. But don’t worry the buckeyes are not hard at all and you can place one in your mouth and it will simply melt. Ohhhh, melting chocolate and peanut butter, pure heaven in my eyes. A sweet, creamy, melt in your mouth truffle filled with peanut butter and dipped in dark chocolate. In a large bowl, beat together, peanut butter, butter, vanilla extract and powdered sugar until it pulls away from the side of the bowl and becomes crumbly. Take about a teaspoon size amount of dough and roll into a ball, place the ball onto the prepared cookie sheet. Repeat this process until no dough remains. Add a toothpick into each ball and place in the freezer for 30 minutes. Melt the chocolate in a heatproof bowl placed over a saucepan of simmering water. Dip the balls ¾'s of the way, one at a time, in the melted chocolate. You want to leave a little bit of the peanut butter showing on top (buckeye look). Remove excess chocolate. Place back onto parchment lined cookie sheet. Remove toothpick. Smooth over holes (I didn't ). Refrigerate until firm. Note: Calories are a little less because I had a little bit of chocolate leftover. 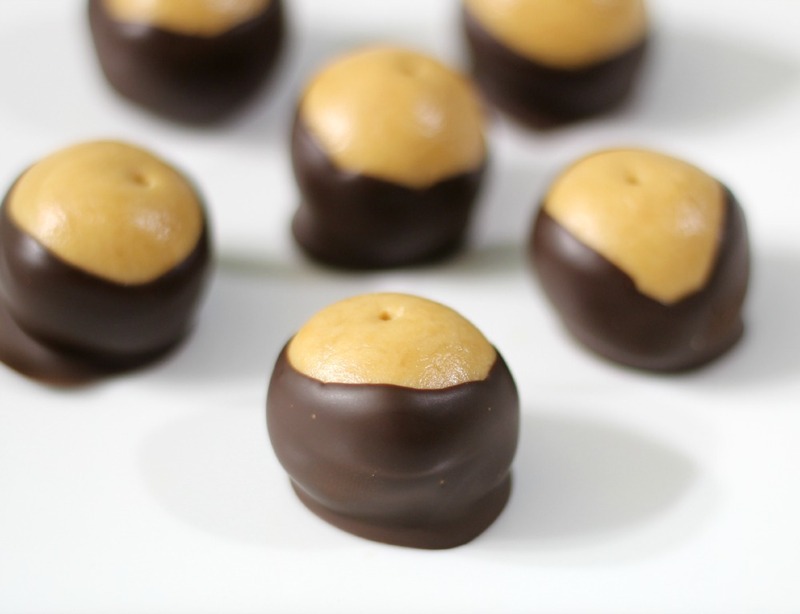 I have to tell you if you’re a peanut butter fan, you will love these buckeyes. I actually never ate one until I made this recipe and oh my gosh, just amazing. Words can’t describe how good it is. Make sure you check out everyone’s 5 ingredients or less. I saw some great recipes that will make some quick meals and treats. So be sure to check out what the gang is making! Sometimes simple combinations are the very best! These look absolutely delish! So, these are basically my favorite confection since I was a kid – and you’re right, they look perfect! Love these…I have a friend who makes them at Christmas, and I always gorge on them! I know these are hard to resist! 🙂 Thanks Wendy! I have only recently fallen in love with peanut butter and chocolate and now I really want to give these truffles a try. Laura, you will go crazy over these! They are simply amazing for PB and Chocolate lovers! My mom used to make these…and it’s been WAY too long since I’ve created a yummy batch! Yours look perfect!!! These were the perfect five ingredient recipe! I love a little sweet treat like this. I love your dessert. What a great idea about rolling them and using a toothpick to dip them into the chocolate. I will be making these! The rolling them in the chocolate with the toothpick is what gave them a nice look. I’m not good with using spoons or forks for dipping. Ohhhhh, great idea! I’ll have to make more because they are gone! Jen, you are right they look professional for sure. I think its been about 15 years since I made buckeyes. Thanks for sharing and bringing back the memory. Hi Marlene! Thank you so much! This was the first time having them and now I am addicted! Those are so sweet looking and would be deadly in this house as I would pop one after the other!! YUM!! These are two of my most favorite ingredients. I need some of these. Thank you for the tips, Jennifer. Next time I am in TJ’s, those dark chocolate pounders are bound to be in my basket…Also, er, I didn’t know what a buckeye was but thanks to you I am now educated! And armed with a delicious recipe! You will love TJ’s pounder bars. So silky, creamy and easy to melt on the stove top in a double boiler or in the microwave. These sound just delicious and so easily adaptable for a dairy free diet! Yay! I can never get enough chocolate and peanut butter. 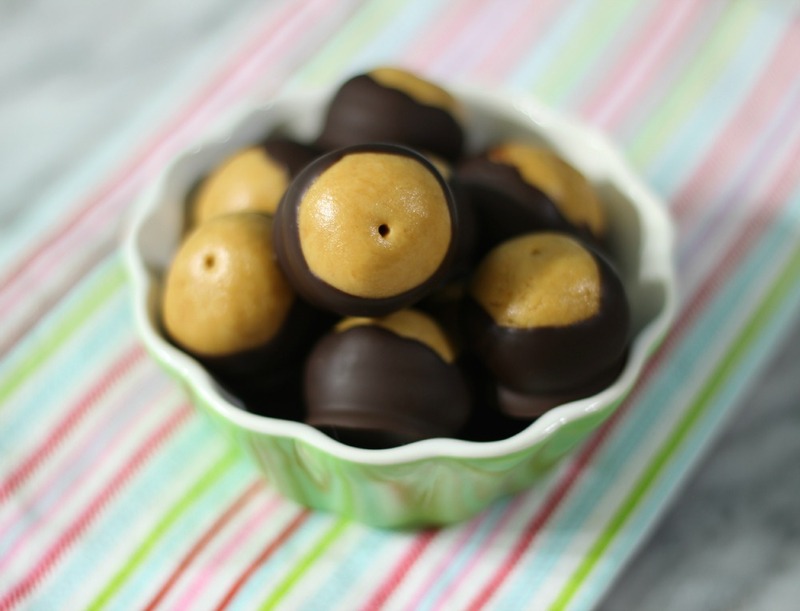 These tasty little buckeyes would disappear VERY quickly in my house! They went pretty fast! Who can resist PB and Chocolate? Oh my – I really need to eat something sweet now that I saw these beauties! You should make them for them! They are so good! 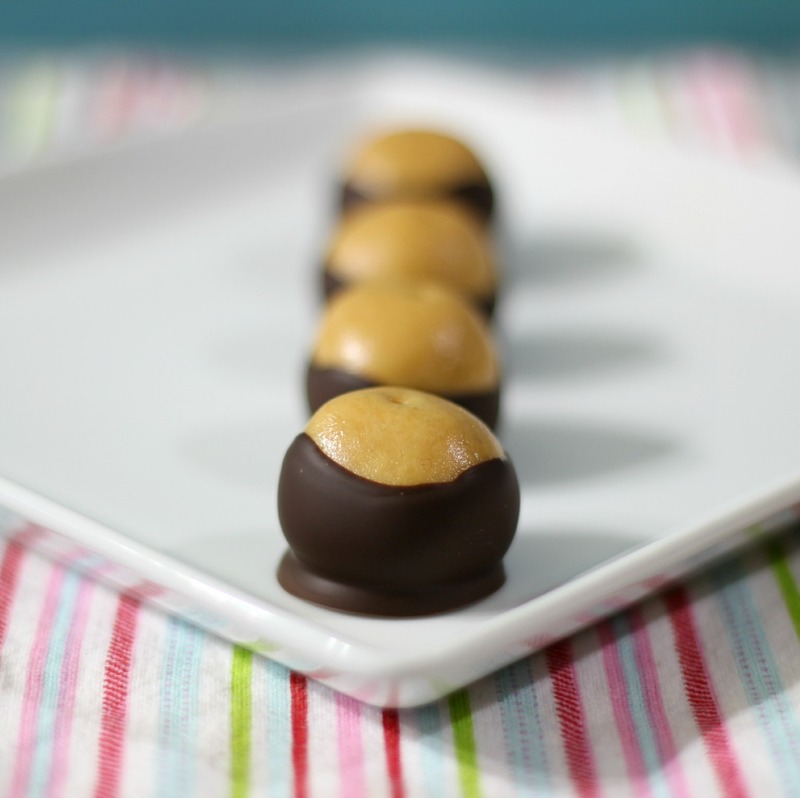 Peanut butter and chocolate is such a classic combination and one of my absolute favorites. Your buckeyes look wonderful and perfect, Jennifer! Thank you! Let me know what you think if you make them! Oh my! These look like the best Reese’s treat ever. Thank you! I love chocolate and PB together! Ohhhhh, graham crackers is a great idea! I love that! 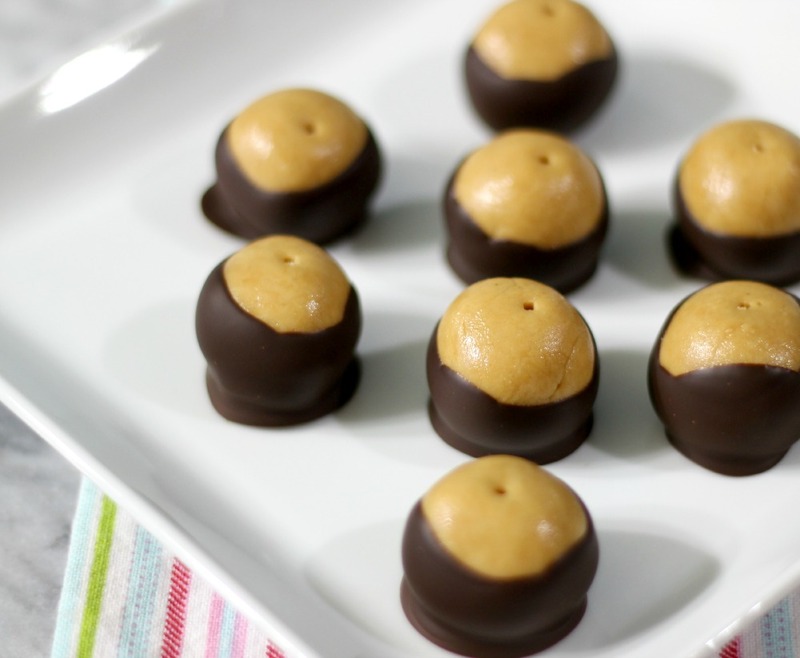 I have never had buckeyes, but after seeing yours I know I need to! Saying that I am a peanut butter fan is an understatement. 🙂 Don’t trust me around these! They look irresistible. Can’t go wrong with chocolate and peanut butter! Mmmmm – you can’t go wrong with peanut butter and chocolate combined!!! I love a good buckeye…yum! 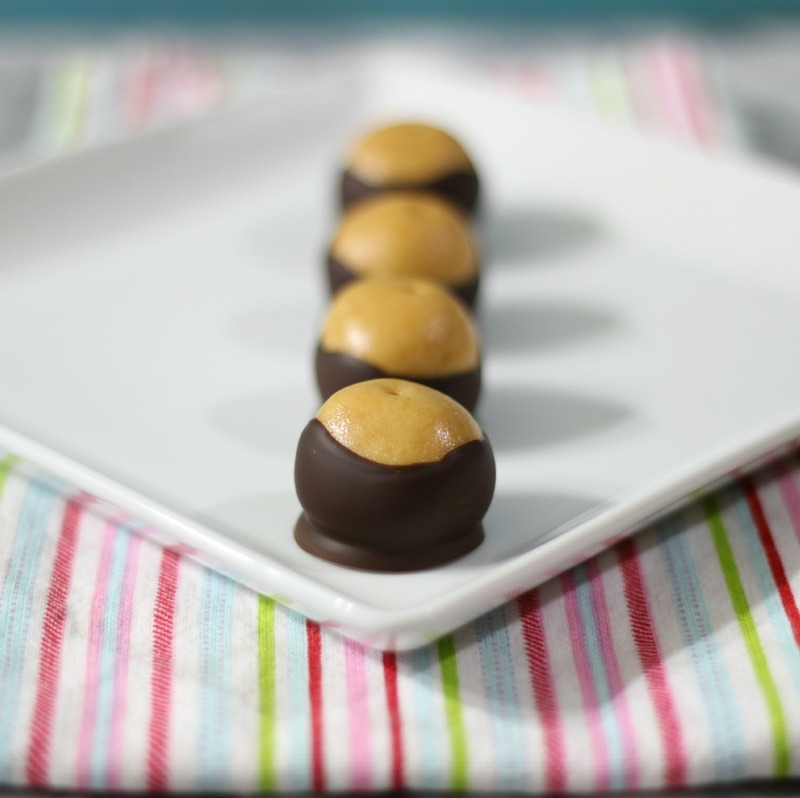 Pure and simple chocolate and peanut butter heaven!